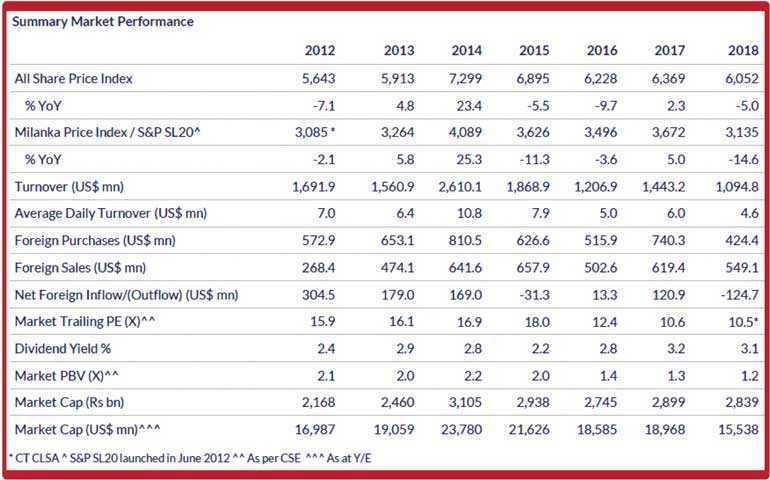 Key insights from equity market strategy from CT CLSA Securities Ltd. 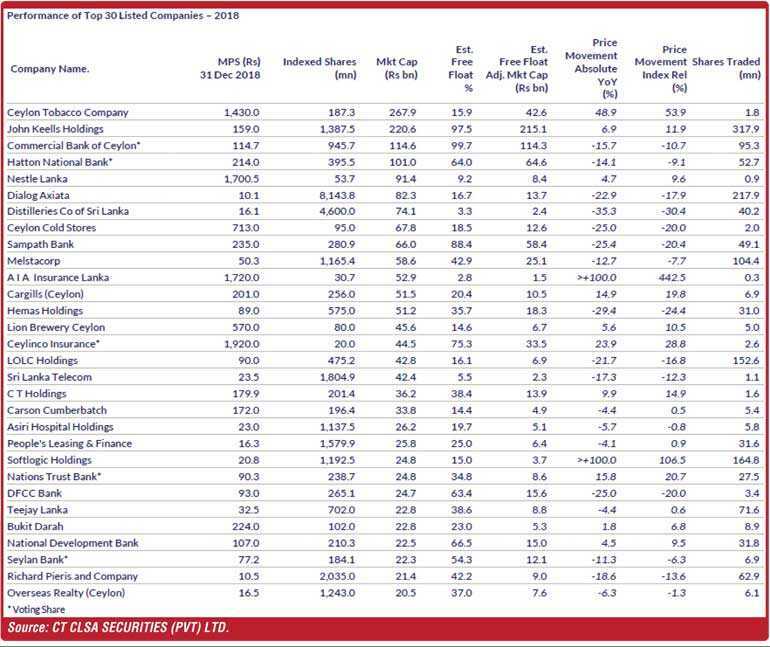 The Sri Lankan stock market witnessed a decline in 2018, with the ASPI declining -5% to 6,052 points , whilst the more liquid S&P SL20 fell -15% to 3,135 points - steepest decline since 2011 (vs. gains of +2% and +5% respectively in 2017). Downward movement of the ASPI is primarily on the back of price declines recorded by index-heavy blue chip Banks, Finance and Insurance (BFI) stocks, coupled with a dampening of investor sentiment stemming from sharp currency depreciation witnessed during the latter part of the year. Average daily turnover fell to US$4.6mn in 2018 – lowest since 2008 (vs. US$6mn in 2017). Foreigners were net sellers in 2018, with a net outflow of -US$125mn (vs. a net inflow of US$121mn in 2017). The stock market is expected to face near term pressure from the anticipated upward movement in interest rates, on the back of the money market remaining in deficit territory for most of 2019E. Further, finance company FD rates have witnessed a sharp rise in early 2019, which will impact the opportunity cost of equity investing in the near term. Given the recent trends in interest rates and the anticipated deficit liquidity levels in the market due to increasing overall borrowings, 12 month Treasury yields are forecast to increase 130bps YoY 12.5% as at 31 December 2019 and further increase 80bps YoY to 13.3% as at 31 December 2020. Meanwhile, the LKR is expected to be under pressure in the near term, at levels above the average annual depreciation rate of the past decade (though at a lower level than witnessed during the latter part of 2018). Average LKR is forecast to depreciate 7% and 8% to a Y/E external value of Rs.195/US$ and Rs.210/US$ in 2019E and 2020E respectively. GDP growth is forecast at an average of +4.3% p.a. for 2019E - 2020E - below its potential levels of ~6- 7%, given Sri Lanka’s Investment to GDP ratio of ~37%. The GoSL has set its sights on attracting US$3bn worth of Foreign Direct Investment (FDI) in 2019E, and is focused on accessing larger markets through free trade agreements with India, China and Singapore. 2019E is expected to witness two important election periods; the delayed Provincial Council elections and the Presidential election. Details pertaining to the exact timeline of these elections are expected to follow the National Budget 2019 (set to be presented in Parliament on 05 March 2019). Given its poor performance at the Local Government election in Feb 2018, the United National Party (UNP) is expected to resort to populist measures to turn voter sentiment in its favour. With President Sirisena indicating his intention to seek re-election, an early Presidential election can be called commencing 09 Jan 2019, whilst if President Sirisena is not seeking re-election, a decision on a Presidential election date can be delayed until 09 Nov 2019, and must be held before 08 Jan 2020. Given the current uneasy co-existence between political leaders and the major political parties, political risk continues to remain at elevated levels. IPO activity remained limited in 2018, with only 2 equity listings during the early part of the year. Given the current low valuations, and limited local interest, IPO activity is likely to remain subdued in 2019E. Given the political uncertainty and rising interest rates, the market activity of local state institutions is expected to be limited in 1H2019E; the Employee Provident Fund (EPF) had in late-Aug 2018 indicated of its return to the stock market – The EPF withdrew from stock market trading following investigations into controversial bond trades in 2015. Whilst the potential divesture of GoSL stakes in the Grand Hyatt and Hilton [Hotel Developers (Lanka): HDEV] as indicated previously may boost market activity, the same would also be challenging due to the upcoming elections. MSCI FM and EM Indexes have witnessed a decline, falling -15% and -17% respectively in 2018 (vs. a +32% and +37% growth in 2017), primarily believed to be on the back of subdued investor sentiment stemming from ongoing trade tensions between the US and China. Meanwhile, a less hawkish monetary policy that is set to be adopted by the US Federal Reserve in the near term is expected to assist equities in 2019E. Whilst Sri Lanka ranks low in scale and liquidity amongst other frontier markets, it can be seen as a market which offers relative stability and growth to investors. Further, the Sri Lankan market remains relatively insulated to market pressures, on account of a low correlation with global emerging markets. 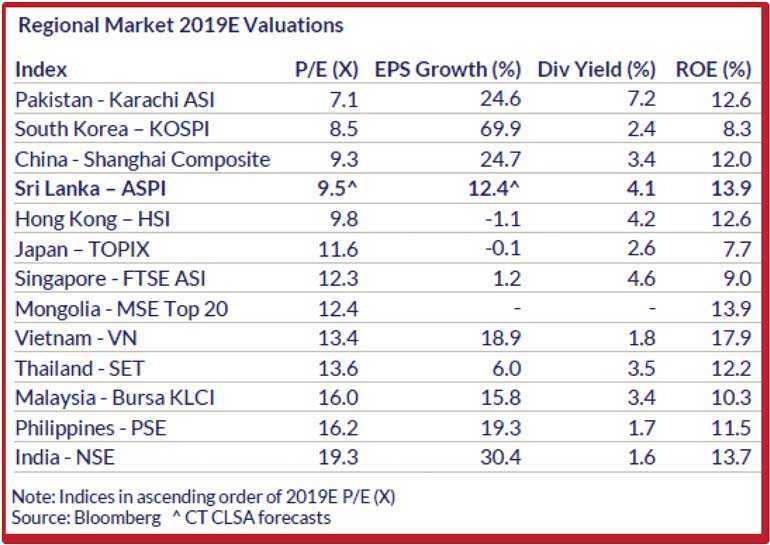 Forward market valuation of 9.5X for 2019E is at a discount to a majority of regional peers, on the back of an expected earnings growth of +12% YoY. Select key stocks, particularly in banking, consumer and export-related sectors offer relatively attractive valuations, backed by strong earnings growth prospects. Whilst the overall market performance is likely to remain subdued in 1H2019E, opportunities for possible M & A plays cannot be ruled out in the near term. A relative improvement in political stability in 2H2019E or 1H2020E would result in a clearer economic outlook over the medium term acting as a catalyst for attracting investments, and thereby help re-rate market valuations. Money market to remain in deficit territory during most of 2019E, as total debt repayments for the year amount to US$5.9bn; this in turn is anticipated to drive interest rates up in 2019E. Credit growth to average ~16% - 17% YoY for 2019E, driven by corporate borrowings amid anticipated relatively higher interest rates and retail borrowings (depicted via increased margins from both retail and corporate for lenders) due to anticipated near term fiscal handouts ahead of key elections. The CBSL likely not to pursue a tight monetary policy owing to country’s real GDP growth remaining significantly under its potential level of 5% (4Q2018 is estimated to be ~2.1%). Given the requirement of a single policy rate by 2020 in order to adopt a flexible inflation targeting regime, the CBSL may possibly opt to only increase the standing deposit facility rate in order to perform any policy response with minimal increases adjusted via the standing lending rate. Given the recent trends in interest rates and owing to anticipated deficit liquidity levels in the market due to increasing overall borrowings, we forecast 12 month Treasury yields to increase 130bps YoY to 12.5% as at 31 December 2019 and further increase 80bps YoY to 13.3% as at 31 December 2020. Spot LKR depreciated 19.1% in 2018 (vs. -2.3% in 2017 and -4% YoY in 2016) to Rs.182.7/US$ as at 31 Dec 2018. The CBSL’s Gross Official Foreign Reserves (GOFR) are likely to be a shade under ~US$7bn as at 31 December 2018, slightly below IMF’s forecast reserve target of US$8.3bn as at end 2018. Further the CBSL reversed its no / minimal forex market intervention policy in order to reduce volatility of the LKR during 2018. External pressure on the LKR to reduce given improved domestic political stability (and due to REER falling below 100% - refer graph) and due to US’s 5 year forward break even inflation declining (to 1.53% for Dec 2018) below the target of 2%, indicating a possible pause to the US Fed’s monetary tightening. The CBSL revised the ceiling for foreign holding (which has fallen to ~3.5% as of now) in the LKR fixed income bond market to 5% (from previous 10%), in order to avoid significant outflows during an Emerging Market or a similar sell off. Given the near term debt payment requirements, we revise up our spot mid LKR forecast to Rs.195 as at 31 December 2019 (-6.7% depreciation for 2019E) and Rs.210 as at 31 December 2020 (-7.7% depreciation for 2020E) . GoSL is yet to present a National Budget for 2019, due to the political turmoil in 4Q2018. Initial statements made by the Ministry of Finance suggest that the GoSL is forecasting its budget deficit at -4.8% of GDP for 2019E. Official numbers are yet to be released - we forecast budget deficit at 5.2% for 2018E (missing the 4.8% number targeted by the GoSL), 5.0% for 2019E and 4.5% for 2020E. Primary account is expected to post a surplus for the second consecutive year (third time since 1986). Fiscal consolidation continued throughout 2018, with the assistance of International Monetary Fund (IMF). IR Act was implemented in Apr 2018, which would help improve direct taxes to 20% of total revenue by 2020. Active Liability Management Act (ALMA) was enacted in Mar 2018 to mitigate Interest Costs. SOE reforms were initiated to control state expenditure (fuel pricing was brought under a cost-based formula from May 2018). We expect the debt to GDP to reduce to 70.0% by 2020E (debt to GDP was recorded at 77.6% at end 2017 and is expected to be ~77.5% at end 2018) and gradually reduce the resultant debt service payments. Export earnings forecast to increase by +5% YoY to US$11.9bn in 2018E, by +6% YoY to US$12.7bn in 2019E, and by +7% YoY to US$13.6bn in 2020E. Pick up in 2019E is primarily expected from industrial export earnings stemming from textiles and garments and rubber products. Further, continued benefits of GSP+ preferential tariff system by the European Union (EU) and the 5 year National Export Strategy (NES) initiated in 2018 are expected to boost Sri Lanka’s export competitiveness. Import expenditure forecast to increase by +10% YoY to US$23.0bn in 2018E, by +5% YoY to US$24.1bn in 2019E, and by +6% YoY to US$25.4bn in 2020E. A deceleration of growth in import expenditure is expected in 2019E amid import restrictions on imports of personal vehicles through higher Loan-to-Value (LTV) requirements and tighter LC margins. Additionally, several non-essential goods, including certain white goods are subject to import restrictions. The possibility of further import restrictions remain if the LKR continues to depreciate. Meanwhile, fuel import expenditure is expected to be volatile in line with global oil prices. Trade deficit estimated to increase by +15% YoY to –US$11.1bn in 2018E (-14% of GDP), by +3% YoY to –US$11.4bn in 2019E (-14% of GDP), and by +4% YoY to –US$11.8bn in 2020E (-14% of GDP). Worker remittances are expected to decrease by -1% YoY to US$7.1bn in 2018E, increase by +3% YoY to US$7.3bn in 2019E, and by +4% YoY to US$7.6bn in 2020E. Meanwhile, earnings from tourism are expected to rise +11% YoY to US$4.0bn in 2018E, by +19% YoY to US$4.8bn in 2019E, and by +13% YoY to US$5.4bn in 2020E. Accordingly, Overall Balance of Payments expected at -US$1.2bn in 2018E (-1.5% of GDP), at -US$0.7bn in 2019E (-0.9% of GDP), and at US$0.7bn in 2020E (+0.8% of GDP). Economic growth forecast to recover to +4.0% YoY and +4.6% YoY in 2019E and 2020E respectively from estimated +3.1% YoY growth in 2018E (4Q2018E : 2.1%). Agricultural sector forecast at +3.6% YoY in 2019E and 3.8% YoY in 2020E (vs. +3.7% in 2018E). Initiatives taken by GoSL to improve agricultural production coupled with World Bank granting US$102mn for Sri Lanka’s agricultural sector modernisation project is expected to positively impact the overall Agricultural sector. However, output of key components (paddy, tea and rubber) will continue to remain dependent upon weather conditions. Industrial sector forecast at +2.7% YoY in 2019E and +3.4% YoY in 2020E (vs. +2.0% YoY in 2018E). The contribution from construction is likely to increase in the medium to long term with projects initiated by both public and private sectors. Service sector forecast at +4.8% YoY in 2019E and +5.4% in 2020E (vs. +4.1% YoY in 2018E). Largest contribution to the sector anticipated to be from Accommodation, Food and Beverage service activities, with the growth likely to be driven by directives initiated by the GoSL to promote the local tourism industry. GDP growth is forecast at an average of +4.3% p.a. for 2019E - 2020E - below its potential levels of ~6-7%, given Sri Lanka’s Investment to GDP ratio of ~37%. National Consumer Price Index (NCPI; base year 2013) point to point recorded at 1.0% YoY for Nov 2018 and annual average inflation recorded at 2.7% (vs. 4.6% under CCPI) amid higher weightage to food category. Upward pressure for the food category remains a key risk, being highly susceptible to erratic weather patterns. Increased crop production would contain the overall food inflation in the near term. Upward pressure from higher import inflation due to weaker currency coupled with the expected volatility in commodity prices. (Sri Lankan Rupee (LKR) depreciated 19.1% against the US$ in 2018). Cost reflective fuel pricing formula based on international prices introduced in May 2018, would result in volatility in local fuel prices. Central Bank is progressing towards implementing a Flexible Inflation Targeting (FIT) framework by 2020 and maintain inflation at 4-5% levels in the medium term, and will possibly introduced a Break Even forward inflation expectation by 2020E. Our annual average CCPI forecast at 4.5% for 2019E and 5.2% for 2020E (vs. 4.3% in 2018). Banking sector of Sri Lanka is expected to undergo a relatively mixed year in 2019E with its bottom-line expected to grow, however with new challenges. Whilst the top line growth of the sector during 2019 is likely to be tilted towards consumer in 2H2019 owing to anticipated near term fiscal handouts due to near term elections, corporate sector borrowing will likely account for a significant portion in 1H2019E lending owing to likely upward pressure on interest rates in 2019E. Net Interest Margins (NIM) and overall spreads of the sector are expected to improve further on account of the rising interest rate environment in 2019E. Current And Savings Accounts (CASA) balances are however expected to deteriorate in 2019E, with likely increase FD rates as opposed to savings rates (that may remain broadly flat in 2019E) of the sector. Most Licensed Commercial Banks (LCBs) may consider selling their respective LCB cross holdings during 2H2019E – 1H2020E (with their CSE listed counters anticipated to appreciate owing to improved political stability by this time) in order to be capital efficient under Basel III w.e.f.1 January 2019. Select relatively small private sector LCBs may issue Tier II capital during 2019E, in order to benefit from the near term interest rate changes and also to be compliant with Basel III standards. New small private sector banks and government owned LCBs remained under capitalized as at 1 Jan 2019, and may need to raise Tier I capital in 2019E. Adoption of IFRS – 09 may possibly increase LCB impairment in 2019E. Based on management indications, the resultant charge for opening loan balance would cost 40bps – 60bps from the sector Capital Adequacy Ratios. With overall price levels remaining relatively low and given near term fiscal handout expectations owing to the upcoming major elections, opex growth of the banking sector is expected to be at high mid single digits for 2019E. A significant proportion of Non Performing Advances (NPAs) are expected to materialize from the Agri-Micro finance, construction and SME facilities in 2019E. Debt Repayment Levy (DRL) which is in effect from 1 Oct 2018 would negatively impact the sector as an increase of +7% to the Financial VAT, resulting in sector effective tax rates increasing to 52% in 2019E to 2021E. Despite increase in loan loss impairment and effective taxes, we believe the sector will be able to maintain its ROEs broadly on track with anticipated increase in sector NIMs in the near term whilst passing on a part of the increased DRL to the end consumer in the near term. 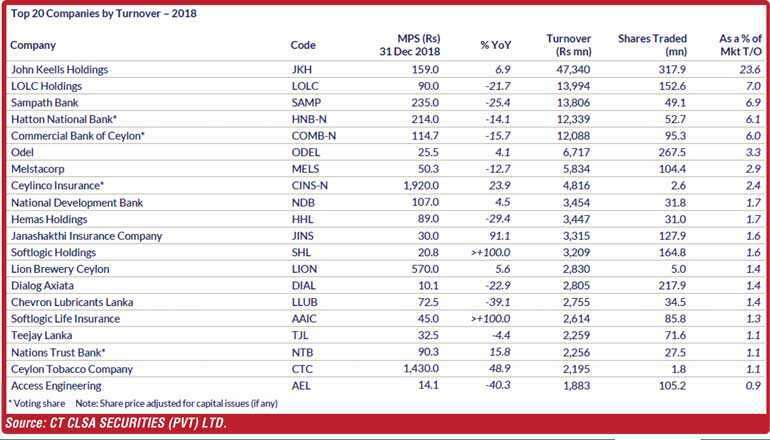 Stock performance wise, most of the private banks that managed to raise adequate Tier I capital prior to 2019 may find themselves better placed for the anticipated “Bank rally” in 2H2019E ahead of elections. This is justified by significantly low valuations and still high ROEs in the near to medium term. Few mid and small size private commercial banks may find it difficult to outperform the market owing to near term concerns of equity dilution for any potential rights issue or a similar capital raising amid their under capitalization. Consumer demand is expected to remain relatively subdued in the near term though we anticipate a pickup on the back of improving macro factors. Soft alcohol industry to continue its recent growth momentum in volumes, subsequent to the excise duty led price reductions in Nov 2017, which in turn has led to pressure on hard alcohol volumes. Meanwhile cigarette volumes are anticipated to witness continued pressure, though tax-led price revisions are expected to result in steady earnings growth. Continued focus anticipated on healthy value added offerings mainly after the imposition of the “Sugar Tax” on carbonated soft drinks in Nov 2017 – downward revisions to the “Sugar Tax” proposed in late 2018 were not implemented. Aggressive expansion in the modern retail space to continue from both private players and state-owned player, Sathosa. Near term margin pressure is however expected on the back of higher operational costs in the new outlets, particularly outside of the Western Province. A potential pickup in raw material prices in the medium to longer term, particularly driven by supply side shocks, coupled with higher import costs stemming from continued currency depreciation, may add pressure on margins in the event companies delay passing on the cost hikes. Construction related material manufacturers are expected to benefit from the construction of large scale infrastructure projects in the medium to long term. Development of the Colombo Port City and Hambantota Port Industrial Zone anticipated to be key drivers for construction material demand post 2019E. Construction material manufacturers are also expected to benefit from the development of affordable housing projects. The GoSL’s ‘Vision 2025’ policy document has indicated of the government’s commitment towards providing suitable housing for all its citizens. All export related companies will benefit from exchange gains stemming from continued currency depreciation in the near to medium term, whilst non-export oriented companies are expected to be impacted by higher input costs. Textile manufacturers are likely to continue to benefit from increased volumes, resulting from the EU’s GSP+ preferential tariff system, coupled with an anticipated near term softening in global cotton prices. Tax benefit from GSP+ at a fabric manufacturer level estimated at 1.5% (total benefit ~9.6%, to be distributed across the entire value chain). Cable and aluminium extrusion manufacturers are expected to benefit from a slight tapering in commodity prices in the near term. Tourist arrivals forecast at 2.8mn for 2019E (+18% YoY), whilst 2020E arrivals forecast at 3.1mn (+11% YoY), with YoY growth to be driven by directives initiated by the GoSL to promote the local tourism industry. Tourist Arrivals rose +10% YoY to 2.3mn arrivals in 2018 - off a lower base, with growth being impacted by negative political developments in late-2018. In October 2018, Sri Lanka was ranked as the top travel destination for 2019, by international travel guide publisher Lonely Planet. Listed tourism players likely to face pressure from the continuing growth in the informal sector, which caters to the price conscious budget travellers. Meanwhile, medium term impact from the informal sector may ease, as the SLTDA is set to actively enforce laws relating to unregistered service providers. Occupancy levels in City Hotels has been under pressure due to increased room inventory, though is likely to rise during off peak seasons, as a result of the recent launch of the ‘Island Escapes’ tourism campaign, whereby hoteliers are permitted to price below the MRR during lean months . The sector will be a net beneficiary of the depreciation of the LKR, due to translation gains made by hotels that earn a significant portion of revenue in US$ terms and from Sri Lanka becoming a more competitively priced tourist destination. The local construction sector has witnessed a slowdown in the recent past given the reserved outlays on infrastructure projects by GoSL. Near term pressures include delays in several GoSL-led infrastructure projects, LKR depreciation (USD/LKR -16.0% in 2018) affecting imported raw material costs and labour shortages. However, sector expected to benefit in the medium to long term from large scale GoSL-led projects such as the Colombo International Financial City, Central Expressway and the multi project Western Province Megapolis coupled with increased private construction activity (i.e. leisure and property development projects). Private sector players with exposure and expertise on leisure and property development are expected to be key beneficiaries. Anticipated conclusion of Provincial Council Elections in 2019E is likely to invigorate certain infrastructure projects at the local government level. However, GoSL infrastructure spending is expected to be constrained given the ongoing fiscal consolidation measures. Meanwhile, increased competition of Chinese and Indian construction firms in Sri Lanka continues to pose a significant threat to the local construction players. Demand for private health services is anticipated to increase continuously due to improvement in income levels, increased prevalence of Non-Communicable Diseases (NCDs), growth in ageing population and growth in the medical insurance sector. Select private healthcare providers are currently engaged in strengthening competitive positions through capacity expansion both within and outside Colombo. Increase in corporate income tax rate to 28% from the previous concessionary rate of 12% w.e.f April 2018, is expected to negatively impact sector earnings across the board in the near term. Government of Sri Lanka (GoSL) exempting private hospitals from VAT w.e.f June 2018 (15% VAT which was implemented from November 2016) - with the exemption of Room Charges - is expected to have a marginally positive impact on the private healthcare industry as a whole. Competition is expected to increase in the near term with more public and unlisted private hospitals coming up. The Health Ministry announced that it would gazette maximum charges for tests, treatment and surgery at private hospitals * Implementing price ceiling for certain tests, treatments and surgeries will negatively impact earnings across the board - implementation of same yet to be determined. Telco sector top line growth may continue in high single digits given recently revised voice levy despite removed voice floor rates. Sector voice floor prices (previously set at Rs.1.5 per minute) were removed on 17 August 2018, that impacted the overall industry by way of increased significant competition resulting in only Airtel gaining market share during 3Q2018. The economic revival package of the new Government, reduced the mobile voice levy from current 25% to 10% w.e.f. 10 November 2018, which is estimated to drive revenue growth in the voice segment for telcos. Sector voice revenue as a % of overall revenue stood at 25% - 30% as at 30 Sep 2018. However, overall profitability will be slightly impacted by the Cellular Tower Levy, CTL: of Rs.200,000 per tower per annum (amended from per month previously) from tower owning telco companies with effect from 1 January 2019. With a resultant 4 player market due to recent Hutch and Etisalat merger, DIAL or SLTL may also find it cost efficient to fast track a possible merger option with Airtel, i.e. the remaining smaller telco in SL, in order to increase profitability resulting in a healthy mobile operator market in the medium to long term. DIAL and Mobitel may likely continue expanding its 4G presence and will likely discontinue significant investments in the 3G space. Despite DIAL successfully launching fully –functional pre-commercial 5G using commercial grade base stations and end user devices, we anticipate DIAL to introduce its 5G network to the market by end 2020E. Given increasing currency pressure due to the strengthening US$, telcos may incur further high finance costs in 4Q2018 and in 2019E, due to majority of sector debt is based on the (relatively increased) London Interbank Offered Rate (LIBOR) contracted under 3 - 6 month floating rates.